Wish you all a very happy and prosperous Maha Shivaratri. Lord Rudra has countless names and titles. Our boundless ocean of literature can give us all those names. 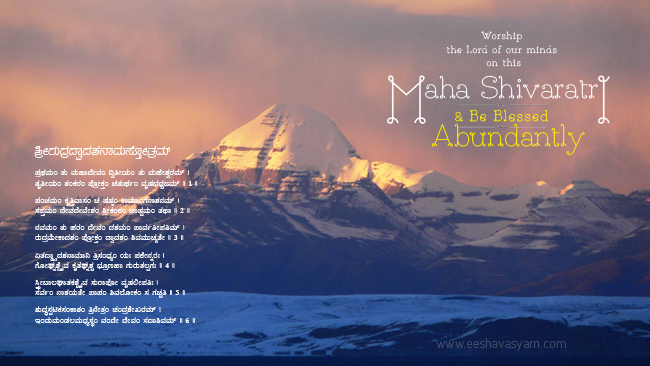 On this occasion of Maha Shivaratri I have tried to give you a wallpaper of the beautiful and divine mount. That is none other than The Kailash. I have added Sri Rudra Dwadasha Nama of Lord Shiva to this wall paper as an essence. This stotra has been fetched from Skanda Purana. This image is just for reference. The actual high-res image with Sanskrit and Kannada version is available at the download link. Feel free to share it with every one. Let me know if you wish to have this pic with a different resolution.